We know three angels by name: Michael, Gabriel and Raphael. Their names always refer to God. Michael means ‘Who is like God’ (we know that nobody is like God), Raphael means ‘God heals’ and Gabriel means ‘the strength of God’. 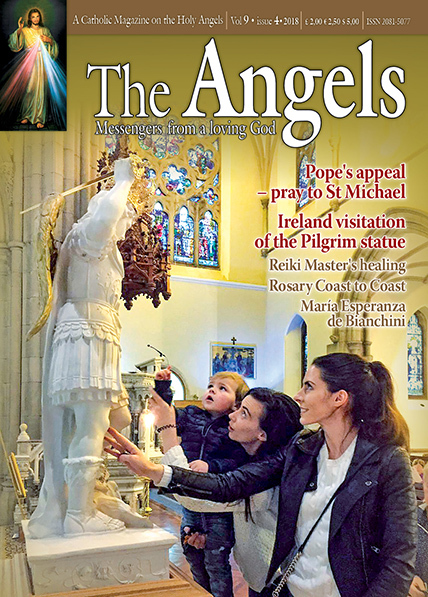 God is always in the centre and this is the crucial difference between the teaching of the Roman Catholic Church and the view on angels by the New Age movement. We say “Focus on Jesus” whereas they say “Focus on angels”. That is why angels are invisible, they do not want to draw our attention to themselves. There is a story in the Book of Revelation when an angel appeared to St John, “I, John, am the one who heard and saw these things. When I had heard and seen them all, I knelt at the feet of the angel who had shown them to me, to worship him; but he said, “Do no such thing: I am your fellow-servant and the fellow servant of your brothers the prophets and those who keep the message of this book. God alone you must worship›” (Rev 22:8-9). So the names of the angels are directed towards God. Sometimes we say with pride “Who is like me? Nobody”. But St Michael always says “Who is like God?” St Michael teaches us not to feed our ego because angels are always in the shadow. But they are present everywhere, they are here, too. We have at least five hundred angels here. These are our guardian angels, the twin brothers of each one of us. If some of you have a twin brother or sister, you know what it means. You were closely together in your mother’s womb and now you are connected very much. So our guardian angels are very close to us. I assure you of the constant daily prayers of the priests of the Congregation of St Michael the Archangel for all our readers and their families.